Christian Aid Nigeria in conjunction with Gender Awareness Trust (GAT) had distributed stater packs worth over N6 million to 96 Kaduna girls to make them self-reliant. 50 of them were selected from Kujama and Rido Hausa communities of Chikun local government while 46 others emerged from Zonzon, Ramai and Fadan Kamantan communities of Zango Kataf local government areas of Kaduna State. 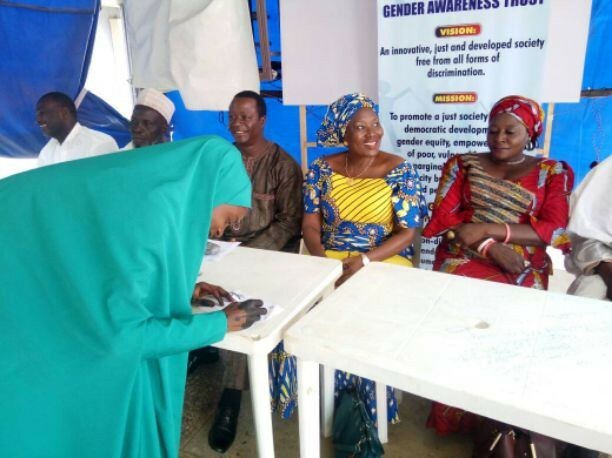 The two collaborating non-governmental organisations have began a project called Collective Action for Adolescent Girls Initiative (CAAGI) targeting adolescent girls from varying communities in Kaduna State especially those that are not in school. The benefiting girls had in the past two years on their own acquired skills in hair dressing, soap making, sewing, knitting and granding before these NGOs came to support them with starter packs so they can move on. Under CAAGI project which is winding up in the state, the focus was on girl-child education, early marriage and economic empowerment, Project Coordinator, GAT, Tida Abbah Leo said. Expressing his happiness during the distribution of starter packs to some of the beneficiaries in Marraraban Rido, Chikun local government yesterday, Wakilin Rido Hausa, Alhaji Jibrin Haruna described the intervention as promise fulfilled. According to him, there have been several occasions where people would be encouraged to acquire skills but would be left without starter packs. But you have proved that you are real and reliable organisations. “We are happy that you people have come to fulfill your promise by given our Christian and Muslim daughters these equipment and materials they need to put into practice what they have learnt. This is a good omen that there is hope for our communities. May Almighty Allah bless you”, he prayed. Earlier, Executive Director, GAT, Dr. Lydia Umar said, the gesture under CAAGI project, was aimed at empowering adolescents and young women to rise above poverty line through robust empowerment which will give them financial autonomy so those that want to further their education can do so. She congratulated the beneficiaries and asked them to consider themselves priviledged, adding that they should reciprocate the gesture of sacrifices made by the international donors by contributing positively to their respective communities. “The gesture would not only change the lives of the recipients but of their families and communities at large. That is why we are encouraging them to remain focus,” she said. Project Coordinator, GAT, Tida Abbah Leo, was optimistic that, the empowerment would reduce the trend of idleness and promote sense of belonging among the women folk many of whom are not decision makers when it comes to economy related issues. Boosting the moral of the girls, Programme Officer, Gender Inclusion, Mercy Onyema, said though the road for adolescent girls to travel was still far, there is hope for Nigerian girls. “The fact that this programme is ending should not mean we are to stop the campaign. For those of you in secondary school, please do not drop out but ensure that you finish the secondary school at least. “We have taught you a lot of things within the past two years. You should not forget those lessons especially the leadership aspect of it. Because as a woman, you will definitely play a leadership role in your family and community. “Please try and become girls we can be proud of. We hope that one day, you will stand as ambassador that will encourage other girls to go to school”, she urged.